The Butler Arts Center has unveiled The Journey from Outside In, a 20-by-40-foot painting by Indianapolis artist Justin Vining that required 263 hours of work spread over three months and 25.5 gallons of paint. 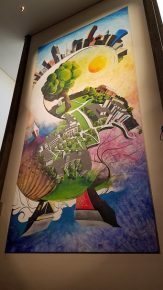 The painting, which will hang in the Clowes Memorial Hall lobby for a year, depicts sunrise over the Indianapolis skyline, the Butler University campus, and farmland on the outskirts of town. The Clowes Hall lobby is open to visitors Monday through Friday from 9:00 AM to 5:00 PM. A time-lapse video of The Journey from Outside In, from start to unveiling, can be seen here. An interview with Vining is here. Vining is an Indianapolis-based artist, specializing and landscapes and cityscapes. He studied Art Education at Purdue University and taught elementary art for three years. Following his tenure as a teacher, Vining attended Valparaiso Law School, where he rekindled his love for creating between classes and clerking. Shortly after graduating and passing the bar in 2010, he decided to pursue art full time and hasn’t looked back since. Originally from a small farm town in Indiana, Vining finds inspiration from American regionalist painters and WPA-era public works. In his progress as a full-time artist, his artwork has evolved from bright, whimsical watercolors and acrylics to more classical oil scenes. In his exploration of oils, he’s begun working en plein air and exploring more muted, natural tones. In 2017, he plans to continue his exploration in oils, balancing this new found love of plain air painting with his studio work. Starting in 2009, Vining’s work has been displayed in cities and towns throughout Indiana. His exhibits and shows in 2017 have included the 93rd Annual Hoosier Salon Exhibit, Juried Exhibit at the Indiana State Museum; “Painting in the Parks,” a group exhibit in the Garfield Park Art Center; and “Chasing Daylight,” new work by Indiana Plein Air Painters, Hoosier Salon, Carmel.